During its foundational era, Real Ale Brewing released beers at a pace a snail could appreciate. Full Moon Pale Rye Ale and Brewhouse Brown Ale debuted in 1996, leisurely chased by Rio Blanco Pale Ale in 1998. 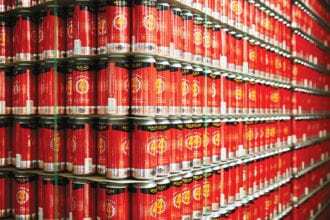 The Blanco, Texas, brewery then cranked its tempo, adding a fourth year-round beer and a single annual release in 2002. President Brad Farbstein was good friends with the founder of Austin bicycle company Firemans Texas Cruzer. They’d ride bikes and drink beer, a synergy the small businesses decided to embrace. “We thought it would be cool for a beer to promote his bikes, and when people rode his bikes they could get our beer,” Farbstein says. While they may never generate click-bait headlines, breweries are betting on blondes as an everyman, everyday offering. At most American brewpubs in the early ’90s you ordered a pint by consulting a color wheel. There were red ales and black stouts, blonde beers as radiant as summer sunshine. Tint tipped drinkers to flavor. The visual shortcut was essential in an era short on education. As the years disappeared and beer accelerated in popularity and complexity, blonde and golden ales seemed as antiquated as eight-tracks, especially in the aggressive face of double IPAs and barrel-aged everything. Firemans #4 is Real Ale Brewing’s flagship blonde ale. | Photo by Max Kelly. 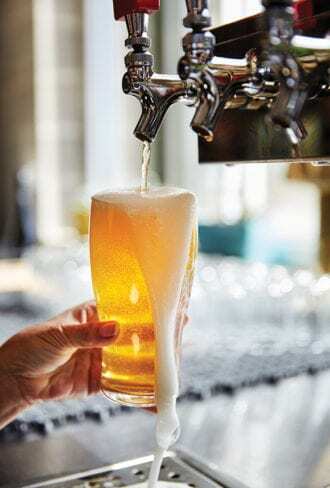 While they may never generate click-bait headlines, breweries are betting on blondes as an everyman, everyday offering. 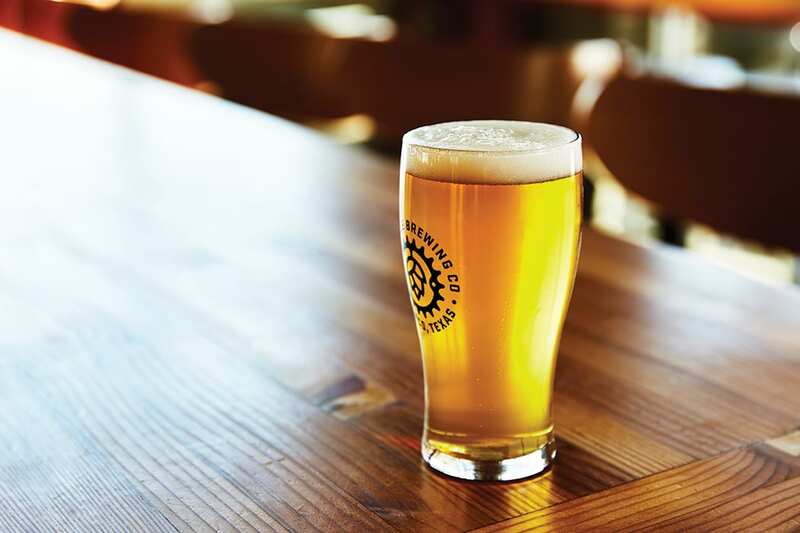 In January, San Diego’s IPA-centric Green Flash Brewing Co. unleashed GFB Blonde Ale, while Florida’s Funky Buddha Brewery debuted Pineapple Beach. Firestone Walker Brewing has found such success with their 805 blonde ale—primarily sold in California—that it now accounts for nearly 60 percent of the brewery’s annual production. Schlafly sees the blonde ale as an experimental platform, spiking Double Bean Blonde with coffee and chocolate, and Armadillo Ale Works puts mesquite beans in Honey Please. Founding a brewery with a blonde-ale focus is a bit like launching a wedding cover band. Both are crowd-pleasers, but there’s a slight stigma. Shouldn’t you be doing something a bit more, well, original? “That’s what GFB means to us,” Hinkley says of his blonde ale. It’s teensy in ABV and packing a pleasant orange-peel scent, tasty without demanding taste buds’ total attention. Unlike the brewery’s barrel-aged sours and bittered-up double IPAs, GFB rides shotgun to good times instead of steering the conversation. 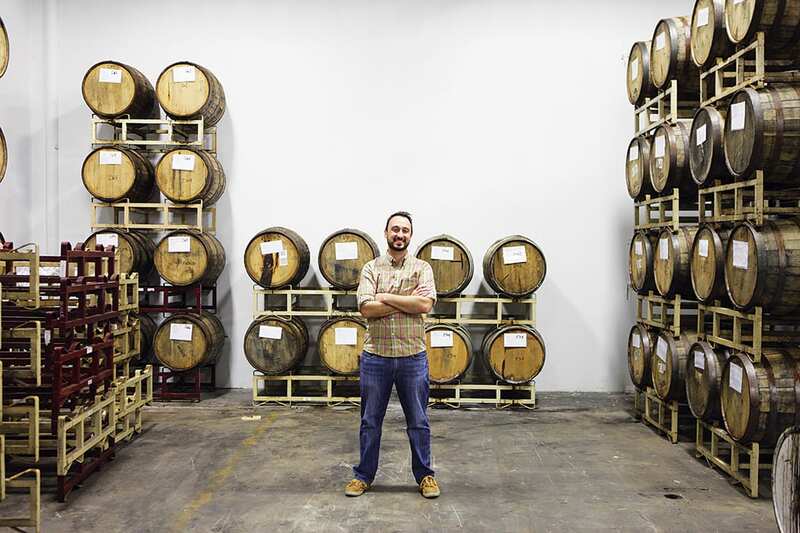 “You can have quality, flavorful beer that maybe takes itself a little less seriously,” he says. Funky Buddha’s Pineapple Beach is an easy drinking departure from the brewery’s other fanciful beers. | Photo by Graciela Cattarossi. Few American breweries are as respected as Firestone Walker. Brewmaster Matt Brynildson slays every style, from pilsners to IPAs, barley wines, oatmeal stouts and beyond. “805 is none of those things,” co-founder David Walker says of the brewery’s best-selling blonde. It stemmed from other larger international breweries trademarking area codes. “We grabbed our own and brewed a beer for local bars to celebrate,” Walker says. The 805 region is a complex stew of cattle ranchers and farmers, cowboys and surfers, musicians and motorcycle riders living amid an “abundance of natural beauty fading into the Pacific,” Walker says. What better to bring them together than a clean, elegant blonde ale? “Everyone who drinks it finds the experience pleasing,” Walker says. Firestone intended to only sell 805 within the current and historic confines of the area code surrounding their Paso Robles brewery. Growth spread organically as fans bootlegged the beer as far away as Arizona and Nevada, and within two and a half years of its 2013 launch, 805 rose atop Firestone’s sales charts. Last year, Firestone started selling its local handshake in three additional states, including Texas, testament to the power of doing one beer, and doing it well. “805 is a singular beer with no deviation or intent to change or capitalize on it with ‘innovation,’ ” Walker says. Founding a brewery with a blonde-ale focus is a bit like launching a wedding cover band. Both are crowd-pleasers, but there’s a slight stigma. At their best, blonde ales are torchbearers of balance and subtlety. Kona Brewing Big Wave Golden Ale, Southern Star Brewing Bombshell Blonde Ale and Ska Brewing True Blonde Ale are equally comfortable alongside salads, baseball games and afternoons spent mowing the lawn. It’s tough to hate a blonde beer. That is, if you can convince someone to try one. Funky Buddha brand director John Linn says “Just because it’s a light beer and something you drink when it’s hot out doesn’t mean it’s a bad thing.” | Photo by Graciela Cattarossi. The blonde ale’s beauty is that it quenches without torturing tongues, a beer’s beer without being bland. Its neutrality also appeals to brewers seeking their next great taste trip. Victory Brewing gooses Summer Love Ale with hops both European and American, giving the golden ale an earthy snap of lemon and pine. New Belgium Brewing fills Dayblazer Easygoing Ale with citrusy Cascade hops. And Dogfish Head’s latest Beer to Drink Music To is a self-professed “tropical blonde” kissed with hibiscus and kiwi juice. Florida’s Funky Buddha has earned its reputation on twisting beer styles like a pretzel, creating culinary concoctions such as French Toast Double Brown, Maple Bacon Coffee Porter and Lemon Meringue Pie blonde. Any intrepid drinker will try the beers once. Twice? Maybe not. “We saw that our customer base was hungry for beers they could drink a few of,” says brand director John Linn. Another burgeoning variant is the coffee blonde. Goose Island Beer’s Fulton St. Blend is flavored with Intelligentsia coffee, and Odd Side Ales brews Bean Flicker Blonde. Schlafly saw a blonde ale as the perfect neutral platform to devise the deceptive Double Bean. After the hazy flaxen ale finishes fermentation, Schlafly rests Double Bean on Ghanaian cocoa nibs before adding Tanzanian cold-brew coffee, creating a chocolaty eye-opener. “One of our sales reps has referred to this beer as a Jedi mind trick,” Hale says. 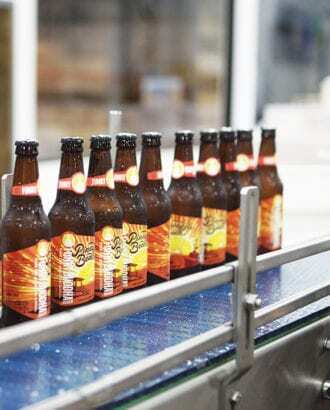 American brewing broadly swirls around two oppositional storylines. Craft and independent brewers make beer teeming with flavor. Conglomerates often formulate beer lightly sprinkled with hops. It’s a battle of artisan versus the machine, a feel-good yarn that often omits one massive fact: Many millions love light, low-ABV beers. Blondes can also provide brewers with an economic safety net that enables tinkering and taking chances. “Firemans drives the brewery and lets us get experimental and drive innovation,” says Real Ale’s Farbstein. His funked-up Mysterium Verum beers don’t need to turn an immediate dime, so they’re permitted to undergo complex, multi-year barrel souring. Sometimes even the simplest beers require a simple explanation. For 10 blonde ales to seek out now, see recommendations here.